Update: Jeff did respond and I've updated this post with his solution. It can be found at the bottom of this article. There is actually a partial JDBC URL visible in the Connection Manager already just to the right of the connection name. It's not the entire URL as required by the JDBC driver, but it can get you there if you memorised the rest of the connect string. Call me lazy, but I've never tried to memorise it so I have to refer to documentation for it. We're not done though. 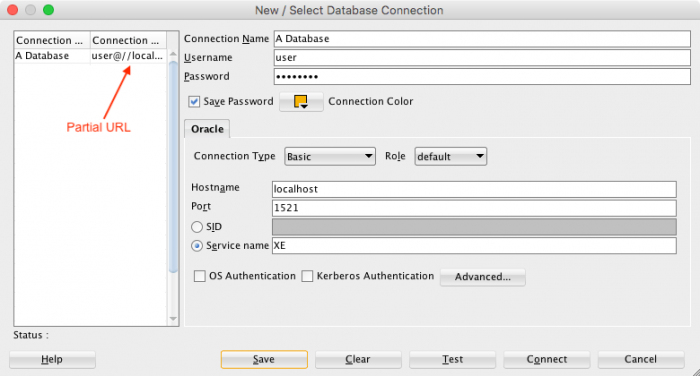 SQL Developer does offer the entire custom JDBC URL already...in its connection export file! For that right click on Oracle Connections, click Export Connections... and follow the wizard to generate a JSON file with all the connection details. The generated JSON file will contain information about your exported database connections, including their JDBC URLs. Perfect! It's not as straight forward as I'd like it, but it works. Jeff's solution is a lot more straight forward. Connect to the database in question and run 'show connection'. It will display all the info you wanted, including the JDBC URL. Perfect! Thanks Jeff!